The following chart is a general view of each portfolio, but keep in mind that each BDC within the portfolios is different. The ‘Dividend & NAV Potential’ measure is important because BDCs with higher dividend coverage can increase dividends or pay special dividends and/or retain value to grow NAV per share. The ‘and/or’ is because BDCs with surplus/spillover income and gains have the ability to increase dividend payouts and/or NAV appreciation. This portfolio is for investors concerned with capital preservation and seeking less volatility along with solid dividends. 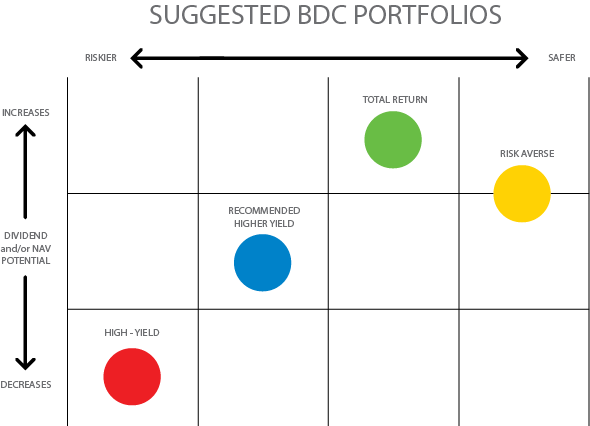 These BDCs typically have lower-than-average yields due to lower yielding and safer investments. Many of these companies have lower fee structures to ensure dividend coverage with lower yield investments. This portfolio is for investors who do not want to ‘babysit’ their investments. Many of the lower-risk BDCs have higher pricing multiples contributing to lower-than-average yields, but during market corrections, they tend to outperform the others with less volatility and still pay a healthy dividend with long-term capital appreciation. The current average yield of this portfolio is around 8.5%. This portfolio is appropriate for longer-term investors concerned with tax-adjusted returns from dependable regular dividends and the potential for special dividends as well as long-term capital appreciation from increased stock values. Overall returns will likely be higher and have more favorable tax treatments while requiring less turnover. However, many of these BDCs are also priced at a premium with correspondingly lower dividend yields and may involve more risk due to higher amounts of equity investments needed for NAV per share growth and the potential for realized gains to pay special dividends. The current average yield of this portfolio is around 9.2%. This portfolio could also be called ‘Cruising Altitude BDCs’ meaning that these BDCs have reached a fully ramped dividend (Tier 2) and are now focused on portfolio maintenance. These BDCs may have lower dividend coverage potentially supported by management willing to waive fees to ensure coverage, hopefully giving them more sustainable dividends than other higher-yielding BDCs. I will be making changes to this portfolio as I revise projections for each company and the Dividend Coverage Levels report. The current average yield of this portfolio is around 10.5%.